Brrr… it’s cold outside! 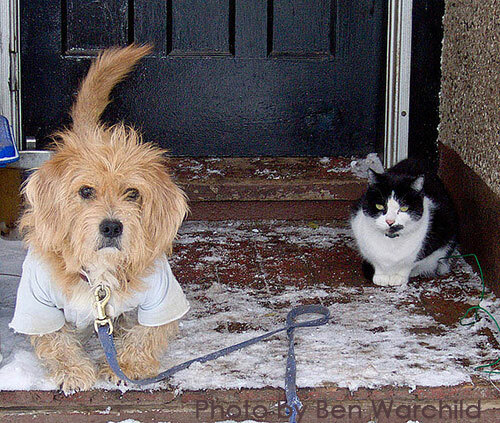 Here are 5 tips on helping our four-legged friends when the temperature dips. Bring them in. If it’s too cold for you, it’s too cold for them! Just like people, animals are subject to frostbite — especially on paws and ears. And also just like people, our elderly and very young pets are the most vulnerable. Keep them indoors as much as possible. Gimme shelter. Make sure animals who live outdoors have a wind-free shelter; warm, dry bedding (e.g., plenty of straw); and extra food and fresh (not frozen) water. If animals don’t have fresh water to drink, they’ll get dehydrated and won’t want to eat — which will make them sick. To keep themselves warm, animals need extra calories, ideally coming from extra protein. Make some noise. Outdoor cats like to sleep under car hoods. If you park outdoors, be sure to bang on your hood — or better yet, pop your hood — before starting your car and taking off. The fan belt and motor can injure them. Someone in our community recently drove to work not knowing that a cat was under his hood; thankfully, our Rescuer was able to get the cat out and have our veterinarians treat his burned paws. Tip: Look for paw prints in the snow! Limit your salt. Ice-melting chemicals can make animals sick, cause irritation or even death. Use paw-safe or eco-friendly products to de-ice. And to protect your pets from others’ salty sidewalks, invest in some boots or rub some paw wax or petroleum jelly on their paw pads before heading out. Wipe those bellies. Salt, antifreeze, or other ice-melting chemicals can find their way to your pets’ undersides and feet. Before they have a chance to lick it off and make themselves sick (or worse), wipe it off! You’ll both be glad you did.